There’s something about the Ballpark in Arlington this season. The latest incident at Arlington involved a member of the prestigious Army Golden Knights, who had the unfortunate luck of getting caught up in the flagpole last night as he parachuted into the stadium before the Texas Rangers- Minnesota Twins game. The soldier, who has not been identified, was not injured. The incident was caught on video by a fan and posted immediately to YouTube. To echo the concern of a fan on the video, I hope this guy doesn’t lose his job. The Golden Knight incident is only the latest bizarre/darkly comical thing to happen at a Rangers game this season. In July, a fan fell from the upper deck in Arlington — and somehow survived — while trying to catch a foul ball during a game against the Cleveland Indians. 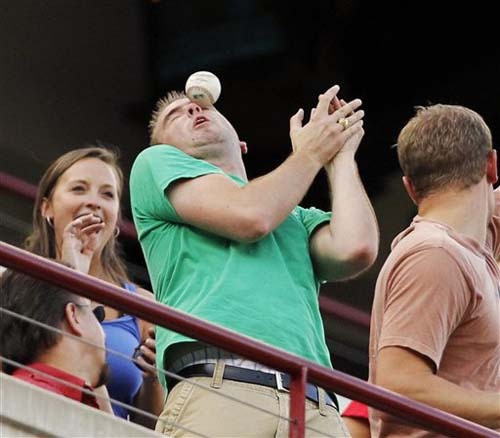 And earlier this week at a game against the Twins, a photographer snapped this classic picture of a fan taking a foul ball to the face. All things considered, the Golden Knight is by far the luckiest of the group.